On June 27, 1945, Ensign Sōichi Mizuchi died at the age of 21 when submarine I-165, which was carrying two kaiten manned torpedoes, was sunk by a US Navy patrol plane east of Saipan. On June 15, 1945, submarine I-165 made a sortie from Hikari Kaiten Base in Yamaguchi Prefecture with 104 crewmen and two kaiten pilots who were members of the Kaiten Special Attack Corps Todoroki Unit. All men on board died when the submarine was attacked. 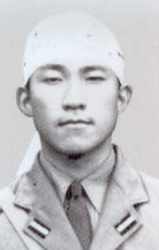 Mizuchi was from Hyōgo Prefecture, attended Waseda University in Tōkyō, and was a member of the 4th Class of the Navy Branch Reserve Students (Heika Yobi Gakusei). He received training at the Navy's Torpedo School. He received a promotion to Lieutenant after his death, which was recognized by the Navy as part of a special (suicide) attack. It was a short enjoyable day. I truly was relieved that everyone is in high spirits. It is natural that young men rise up during the nation's crisis. As a true young Japanese man with restored determination, I certainly will destroy the enemy. I ask that you be strong as a respected leader on the home front. Please raise Shinji to be full of vigor. Since it seems Mother is faint of heart, please treat her gently. This is my request. Well then, I ask that you work hard on the home front. On the way I got off the train one time at Yokohama when an air raid emergency was announced, but please rest assured since I returned to base safely without any harm. This time was a short break, but I truly was relieved by seeing the cheerful faces of all of you. In the train car I looked at the things that I received from you. I truly thank you for thinking about such a person as me who lacks filial piety. Even though I die in obscurity, I will protect you forever. Even though something should happen to me, please be smiling without cutting your hair. It is a pity for Shōko and my younger brothers and sisters . Shinji is still there. Please make your spirit stronger and stronger, and live without worries. I think that it is best that you arrange quickly for Shōko to have a good husband. My request for you is that I hope that you will live cheerfully and free of cares. On another topic, the bentō box lunch was very delicious, and I thought that it would have been good if you had made even more. The letters do not include a date. Based on this and the two letters' contents (e.g., no mention of kaiten mission), it appears that Mizuchi did not consider these to be his last letters before his death. The letters come from Mediasion (2006, 97). The biographical information in the first paragraph comes from Konada and Kataoka (2006, 272-5, 374-5) and Mediasion (2006, 62-4, 85, 97). 1. The number of brothers and sisters is not specified in the letter. He may have had one or more brothers and one or more sisters. Photo taken at time of sortie of submarine I-165. 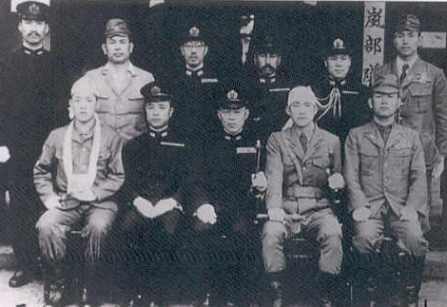 Sōichi Mizuchi is on front row second from right.